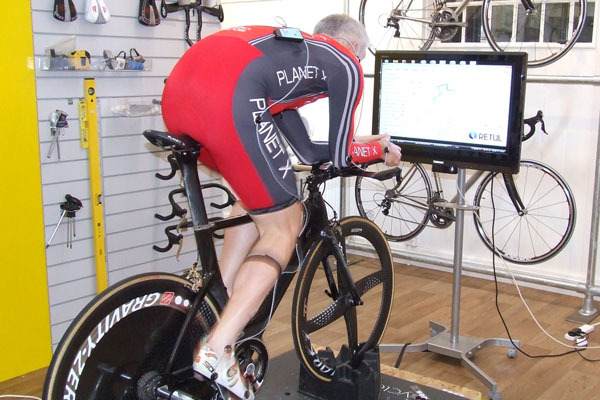 Ian Cammish Bike Fit – I’m a Triathlete! Ian Cammish is often referred to in the cycling press as “Time Trialling Royalty” and a from quick scan of his palmares it’s easy to see why. Nine times winner of the Britain’s Best All Rounder competition, winner of umpteen national titles and as many national records means there are few testers in the UK that can come close when it comes to a riding pedigree. So when Ian told me he’d like to pay our Bristol studio a visit to do a report for an upcoming edition of the now infamous time trial magazine “The Testing Times” I jumped at the chance. With Ian on the bike, it’s clear to see why he’s so fast. He’s a big guy, but lean and powerful with a typical time trial riders build. Even at the age of fifty whatever he is now, he’s enough power output to make the floor shake, but barely moves in his upper body even when putting out a big wattage. First observations were of a pretty low position at the front, but not extreme, a tendency to sit right on the nose of the saddle and almost no ankle extension at the bottom of the pedal stroke. The first sets of Retul measurements from both sides again showed a relatively low saddle position, good hip alignment and a solid central position on the bike with little or no side to side imbalances. Ian is typical of what I’ve seen from elite riders and was completely open to trying out any adjustments suggested. So the first aim was to increase both knee and ankle extension with an increase in saddle height. With that done, the saddle was moved forward to support his already natural forward riding position and stem shorted to close up the angle between torso and upper arm. The results? Well from a purely bike fit perspective the result was a 3 degree drop in back angle (pretty significant for someone already riding pretty low) which should result in better aerodynamics whilst increasing hip angle (a measure of how close the thigh comes to the torso at the top of the pedals stroke) by 3 degrees. A more open hip angle should allow Ian to produce greater power (especially in the top 1/3 or so of the pedal stroke). As for real world results, only time and racing will tell. Watch this space. Ian’s opinion so far? “The bike looks awful, I look like a triathlete”! This entry was posted on Monday, April 26th, 2010 at 12:52 pm	and is filed under All Posts, Bike Fitting, Planet X Bikes, Riders. You can follow any responses to this entry through the RSS 2.0 feed. Both comments and pings are currently closed.